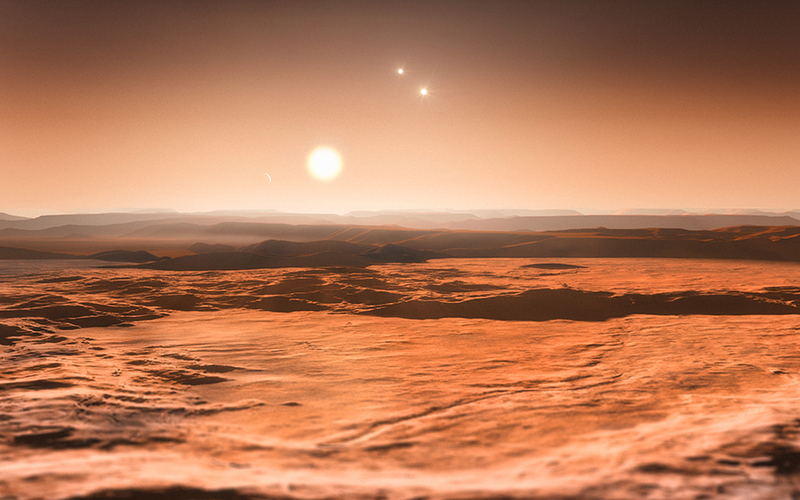 Gas-planet KELT-4AB is located 680 light years from earth and according to a recent study published in the Astronomical Journal, the planet has three suns. Kilodegree Extremely Little Telescope (KELT) is a set of two telescopes located in South Africa and Arizona that helps the detection of planets outside Earth’s galaxy system, better known as exoplanets. The KELT is able to work thanks to the sun’s light and its wide aperture lens. Researchers found the KELT-4AB in a system that was originally thought to be binary, a common case in the outer-galaxy environment. Researchers from the Harvard-Smithsonian Center for Astrophysics quickly learned this was not the case. This planet completes the list of only four planets known to live in a three stars system, but KELT-4AB is the closest planet to earth, with a distance of only 680 light years, researchers will be able to study the planet’s environment more closely. 4AB is a ‘Hot Jupiter’ or Gas planet that takes, approximately, three days to travel around its first star called KELT- A that works as the planet’s sun. The other two stars were given the name of KELT-B and KELT-C and are located in a larger distance of the planet, the two stars orbit one another over 30 years approximately. Researchers determined that four thousand years will have to pass for KELT-B and KELT-C to orbit around KELT-A. Scientists described how a sunset from planet KELT-4AB will look like and assured it would look similar as if the sun in the earth will appear four times bigger while the other two stars will look more distant shining as bright as the moon. Thanks to the discovery of planet KELT- 4AB helps astronomers get a better understanding of how the planet is able to orbit in a distance so short to its star, rumors suggest it might have something to do with a nearby binary system.